Haiti's 'Baby Doc' Duvalier Dies At 63 : The Two-Way Jean-Claude Duvalier, the former Haitian dictator nicknamed "Baby Doc" after he succeeded his father in ruling the country, has died. After a brutal regime, Duvalier was sent into exile in 1986. 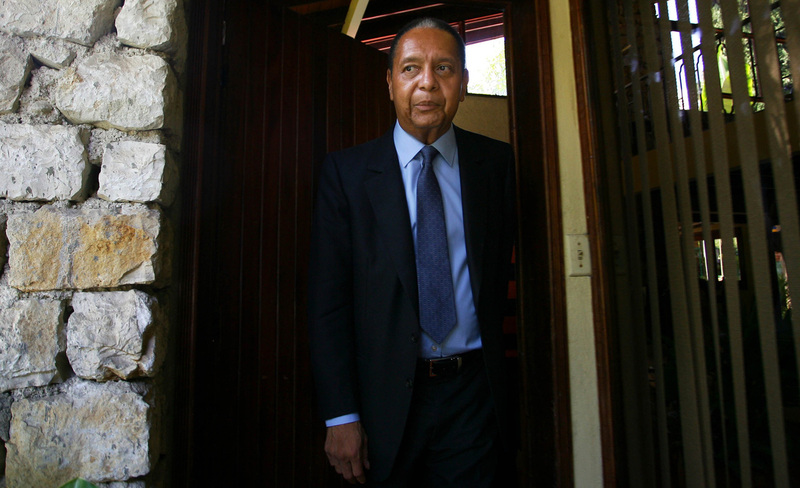 Former Haitian president Jean-Claude Duvalier "Baby Doc" has died at age 63. He returned from exile in 2011. Jean-Claude Duvalier, the former Haitian dictator nicknamed "Baby Doc" after he succeeded his father in ruling the country, has died. Duvalier was the president of Haiti from 1971 to 1986, a brutal regime that ended in his exile. He returned to the country in 2011. Duvalier died of a heart attack, reports Haiti Libre. "His human rights abuse record is really not a pretty one. This is not a man who should be whitewashed. He was better than his father, who was a really bloody dictator, but he was not a decent leader for any country, and there was a lot of unrest in the streets. "His police force, the Tonton Macoutes, were particularly brutal as they realized their regime was coming to an end. And then, the international community got together along with the Haitian civil society and finally said, okay, this is enough. You have to go. "And then, he left on a U.S. cargo plane driving his BMW with his wife and all his trunks right into the plane, and they went to France." In exile, Duvalier burned through the money he had taken with him when he fled Haiti, living in high style on the Riviera. A divorce and tax problems also took a toll on his finances, and in 2011 The Guardian reported that the former dictator eventually downsized to a two-bedroom apartment where his rent was paid by loyal supporters — "many of them Haitian taxi drivers and waiters living in France on modest salaries." The move back to Haiti was widely seen as Duvalier's comeback bid. But he ran into further trouble, as he faced charges of corruption and human rights abuses in his home country. "I address my deepest sympathies to the place of the family and the entire Nation in this sad circumstance. Despite our quarrels and our differences, let's salute the departure of a true son of Haiti. Love and reconciliation must always overcome our quarrels. May your soul rest in peace."